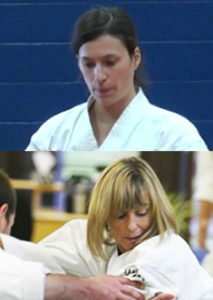 Catherine Lefebvre started iaido in 2000 at the Aikikai of Universite Laval, Quebec, and then joined the Aikido de la Montagne in 2013. She currently holds the rank of sandan in iaido. She also practices aikido since 1999 and has the rank of nidan. She participates in numerous seminars of the East Coast United States Aikido Federation (USAF) and the Kiyoikaze Iaido Federation. Liliane Bourgouin is a Physical education teacher and holder of a diploma from the National Circus School, Liliane began her practice of Aikido in 2002 and iaido in 2004. She is currently ranked 2nd degree black belt (Nidan) in Aikido and a 3rd degree black belt (Sandan) in iaido.